Are you concerned about having a company clean your carpets with harsh chemicals? Do you wonder how that might affect the environment in your home? How it might affect your children and pets? These are very legitimate concerns. Harsh chemicals are tough on your carpet fibers. They leave behind a toxic residue that could very well affect the health of your children and pets, those precious family members who spend so much of their time relaxing and playing on the floor. Chemical residue in the carpeting will also affect the air quality in your home. At OxiGreen in Langhorne, PA, you won’t have to worry about any of these things. OxiGreen says it right in our name! We are a 100% green carpet cleaning company. The cleaning agents we use are 100% eco-friendly. They are biodegradable and completely safe for the environment, for your family and your home. Not only is our carpet cleaning process green, it is also highly effective. Our deep cleaning process goes way beyond the surface to extract the dirt, dust mites, bacteria, and other potential allergens that are trapped deep in your carpet fibers. Unfortunately, most vacuums and carpet cleaners don’t reach deep enough to deal with this debris. Not so with OxiGreen. We will provide a long lasting, deep carpet cleaning that will improve the look, feel and health of your carpeting. The friendly customer service reps at OxiGreen in Langhorne, PA are ready and waiting to take your call at 215-269-3331. You may also visit us online to learn more about our company, schedule a free, in-home carpet inspection, or to learn more about our other interior home cleaning services, including upholstery cleaning, tile and grout, cleaning and more. 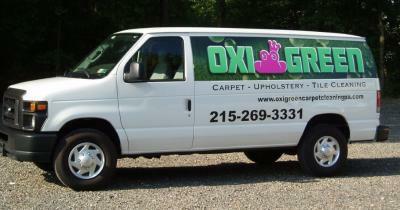 OxiGreen is a super green carpet cleaning company in Langhorne, PA. Give us a call and let us show you what we can do for you!